The stone walls we released earlier this year have gone down a storm, selling almost faster than we can restock them. 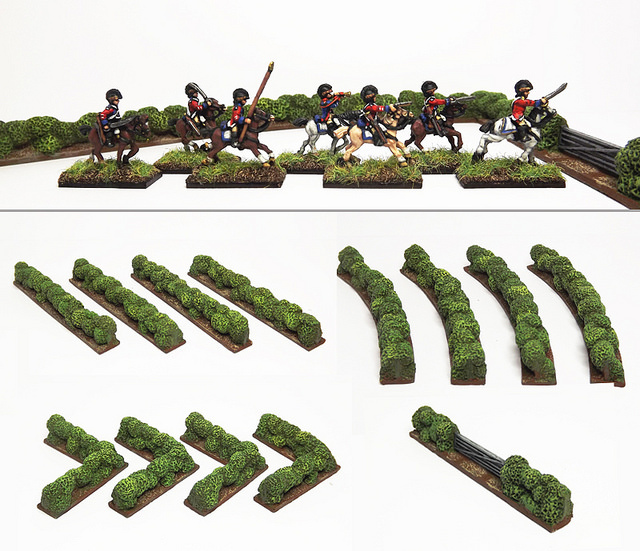 As a result we're expanding our resin ranges with these new hedge sections! As with the walls, these come in packs of 4, with straights, curves, corners and field entrances. Each pack contains a couple of slightly different types as well so that you've got some variation when building your hedge lines. Each section is 80mm long (corners are 40mm in each direction) so each pack provides over 1ft of wall for a bargain £3! The hedges themselves vary between 10mm-12mm in height along their length. Once again, these are the handiwork of John Lowen at Ironclad Miniatures and we've got him busy on lots more goodies to come soon!